For Saint Patrick’s Day, green is the theme colour. We created a special recipe to let you discover asparagus in all its forms. Peel the asparagus. Thinly slice lengthways using a mandolin and place in iced water for a least one hour to make them firm. Mix sherry vinegar with salt and pepper and whisk in olive oil. Set aside. Preheat the oven to 140°C. Sprinkle the parmesan and black and white sesame seeds onto a baking sheet and bake until golden. Cool then cut into pieces. a) Cream of white asparagus: Peel the asparagus and potatoes and chop into pieces. Place in a saucepan, cover with water and add salt. Cover and cook gently for 30 minutes; blend. Add whipping cream; season. Divide between 4 shot glasses to ¾ full; refrigerate. b) Smoked salt foam: Bring the milk and smoked salt to the boil, add the lecithin and blend. Allow as much air as possible to enter the mixture so that bubbles form. Rest and then blend once more just before serving. Prepare and cook the asparagus by following the Le Cordon Bleu technique (Link technique Web). Only keep the tips. Drain the thinly sliced uncooked asparagus and combine with half of the vinaigrette. Place on one side of the plate and season with “fine fleur de sel” sea salt and Espelette pepper. Combine the asparagus tips with most of the remaining vinaigrette and position five on the plate. 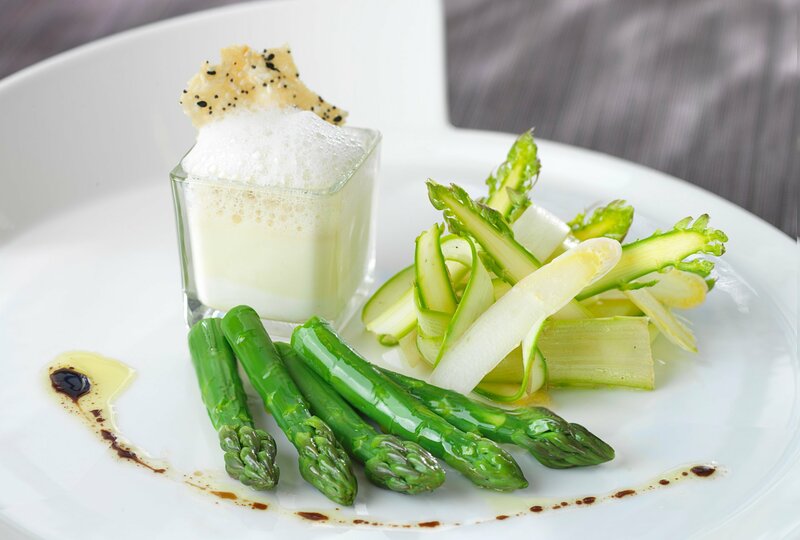 Place a shot glass of white asparagus cream on each plate and top with smoked salt foam (which has been blended once more just before serving) and add a parmesan and sesame seed crisp. Drizzle remaining vinaigrette on the plate.